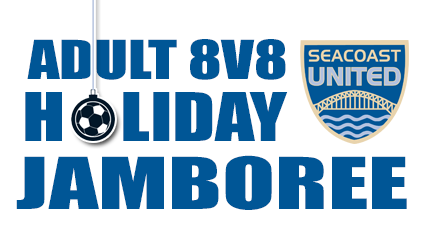 Seacoast United invites you to participate in our first annual 8v8 Holiday Jamboree at our brand new indoor facility in Epping, NH! Participating teams receive two games, 50 minutes in length each. Games will be scheduled in a jamboree/friendly style (no playoffs). Open Coed, Men's Open, and Men's Over-30 & Over-40 Divisions available! Field is 225x150' with full-sized 8v8/9v9 goals (7'x21'). No dasher boards. Questions? Please contact Dan Revis at drevis@seacoastunited.com or by phone at 603-758-7232.